As you know, the Japanese love seafood, not just fish but shellfish such as clams and oysters are also very common ingredients of Japanese cuisine. Clams and freshwater clams are commonly used in miso soup or steamed with sake. Shellfish can be purchased from supermarkets and fish shops, though, you can also go to the beach and catch them by yourself. There are a few places for clam digging around Tokyo, some for fees and some are free. This column will introduce clam digging spot that can be accessed by public transports. This place is known as the closest clam digging spot from the central Tokyo, though, visitors are allowed to do clam digging on appointed days. Opening days and time is noticed on the website. It is recommended to check it online before you visit there. A few species of clam can be seen here including ordinary seawater clam. This is just a muddy flat near the sea in the neighborhood, though, it is known for a good size of muddy beach and quietness. The neighbors repeatedly come here to catch razor clams from March, the beginning of shellfish digging season. Of course this place is free-of-charge as this is an ordinary riverside unlike an officially developed seaside park. But note that sometimes footing can be poor for the same reason, so you may need a change of clothes. Hard-shelled clam is the most common seashells in this spot. 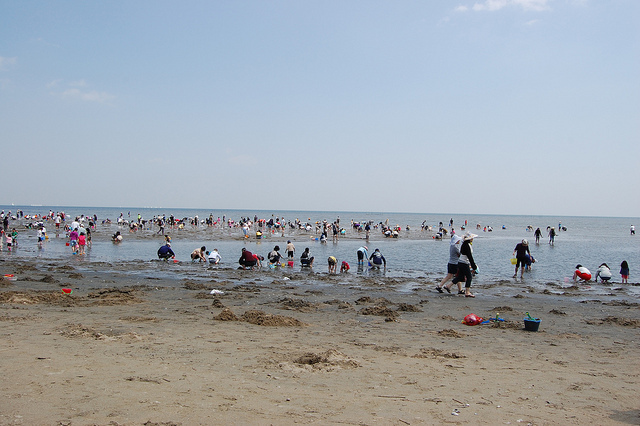 Chiba is the most popular area around Tokyo for shellfish digging. Kisarazu-city has a few popular clam digging spots, and Kisarazu Nakanoshima Park is known for the best access from the central Toyo by public transport. Well, it is still 25-minutes’ walk from the nearest railway station, but worth visiting as this place is so rich with seashells. Clam, Gould’s razor shell, large clam and bloody clam is mainly seen at this place. Marine Park is located in kanazawa-ku, Yokohama-city, just opposite of Hakkeijima. The clam digging beach in this park is the most popular spot in Yokohama. The beach will be very crowded during peak season, but don’t worry, you will never miss out as the beach is so big! In addition, it is free. Clam, duck clam, Venus clam, razor clam is popularly seen here. Note that there are restrictions for the size and weight of clams you are allowed to catch. Access: Immediate from Kanazawa Seaside Line “Uminokōen-Minamiguchi”, “Uminokōen-Shibaguchi” and “Hakkeijima” station. Yes, it’s better to be prepared when you go for clam digging. You may be able to quickly get those tools from a stole on the site, but it is not guaranteed. Remember, shellfish easily get spoiled when left without water for too long, so you need to keep them on a strainer soaked in sea water. Also, a cooler box or bucket is must-have to take clams home. You will be crouching on the beach for long time when you do clam digging. Sunlight is always stronger than you expect, therefore good sun protection is must-to-have. Also, spring sea breeze sometimes feel quite cold, so it is always better to bring an extra top as well as a set of change of clothes. Try to arrive the beach about 2hours ahead of high tide. It gets harder and harder to dig shellfish after low tide as the sea water start coming in. Make sure to check a tide chart on the day beforehand. Spring is a season for clam digging. It may look a little boring as what people do is just crouching on the beach and keep digging to find shellfish. But once you start it, it is quite a fun and unstoppable especially when you are getting a good catch. If you are taking shellfish home, make sure to de-grit it before cooking by soaking in salted water similar ratio to seawater for a few hours.